Background/Info: Apocryphos is the dark-ambient driven project set up by Robert C. Kozletsky. 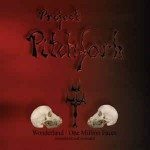 The man got recognition as a member of Psychomanteum, Kerrstillingskozletskynyströmpetrus and Shock Frontier until he finally decided to set up this new solo-project. The first album “The Prisoners Cinema” was released in 2015 on Cyclic Law while he also contributed to the conceptual “Onyx” album released on Cryo Chamber (2015) reassembling Kammarheit and Atrium Carceri. “Stone Speak” has been inspired by the familiar theme of ‘what lies beyond the borders of mortality?’. Content: The answer to the question, which directly inspired this work, remains unknown, but Kozletsky didn’t spare any effort to get in touch with the death or their ghosts… He recorded field recordings visiting so-called ghost towns, cemeteries and sites of old Indian burial grounds. It creates a kind of ghost whispering passages mixed with this familiar impression of cold-cellar music. The electronic manipulations and field recordings together create an imaginary requiem for a nihilistic world. The trip brings us quite progressively towards a few real sound climaxes, which during a track is accentuated by a kind of thunder noise. This is a kind of sonic canvas where humming sound waves and other icy, space-like sounds come together, and create a mysterious chilling atmosphere accentuated by low, resonating passages. 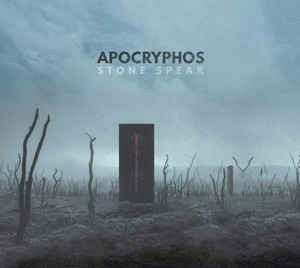 + + + : It didn’t take that much time to Apocryphos to become an efficient project in the dark-ambient genre. 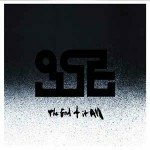 The new album confirms the promising debut of the album “The Prisoners Cinema”. There’s a well-crafted twist between the typical obscure ambience and impressive sound treatments with some extra space elements on top. The track “Unmarked And Overgrown” is a little masterpiece. – – – : There’re no real minus points on this album. Both last cuts are maybe a little less inspired and finally stagnating in a kind of ‘simple’ dark-ambient sound formula. Conclusion: “Stone Speak” feels like travelling upon a dark sonic ocean where you rapidly will get lost from any familiar ground. The imaginary whispers of the dead might be your single company throughout this desolate enterprise. Best songs: “Unmarked And Overgrown”, “Simulacrum Of Stone”, “Tenebrous”.